When the attack ended shortly before 10:00 a.m., less than two hours after it began, the American forces has paid a fearful price. 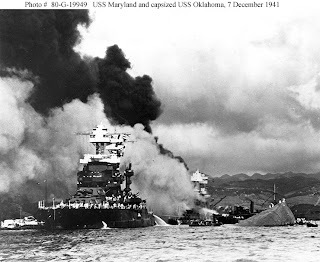 Twenty-one ships of the U.S. Pacific Fleet were sunk or damaged: the battleships USS Arizona (BB-39), USS California (BB-44), USSMaryland (BB-46), USS Nevada (BB-36), USS Oklahoma (BB-37), USS Pennsylvania (BB-38), USS Tennessee (BB-43) and USS West Virginia (BB-48); cruisers USS Helena (CL-50), USS Honolulu (CL-48) and USS Raleigh (CL-7); the destroyers USS Cassin (DD-372), USS Downes (DD-375), USS Helm (DD-388) and USS Shaw (DD-373); seaplane tender USS Curtiss (AV-4); target ship (ex-battleship) USS Utah (AG-16); repair ship USS Vestal (AR-4); minelayer USS Oglala (CM-4); tug USS Sotoyomo (YT-9); and Floating Drydock Number 2. Aircraft losses were 188 destroyed and 159 damaged, the majority hit before the had a chance to take off. American dead numbered 2,403. That figure included 68 civilians, most of them killed by improperly fused anti-aircraft shells landing in Honolulu. There were 1,178 military and civilian wounded. Given a 5 hour time difference between Oahu and Washington D.C., 10 a.m. Hawaii time is 3 p.m. Eastern, 2 p.m. Central, 1 p.m. Mountain and 12 noon Pacific. My father and his brothers and my father-in-law were called to active duty shortly thereafter along with millions of other young American men. On the home front, some people were not allowed to join up due to the nature of their jobs. For example, my mother's brother worked for DuPont explosives and was not allowed to serve in the military. Women entered the work place to take up jobs that had traditionally been solely performed by men. Many also volunteered to serve in the military. Others took up important roles in the Red Cross. It was a total effort. Today many have no idea what a full mobilization would be like. That's how to respond to attacks - pick yourself up and fight back.